Western Washington residents know we’ve had some early-fall cold and wet weather this past week. 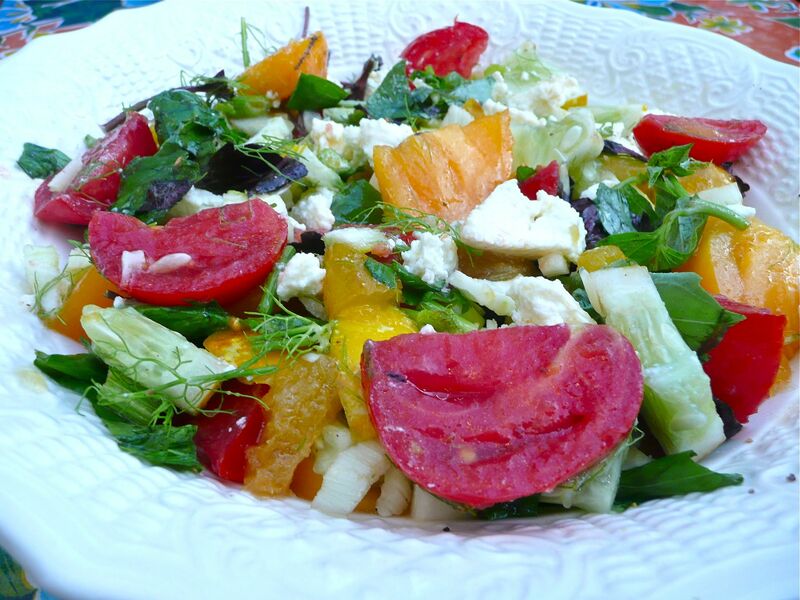 But in honor of the changing skies — today and tomorrow should be warm and sunny — I’m giving you an insistently summer salad. It’s all stuff that should be at the peak of ripeness at the markets right now. The motivation for this salad came from some wonderful fresh ricotta I’d bought from the Broadway Farmers Market (Willapa Hills). We were looking for a bright, fresh side dish to an oxtail stew, and we were looking to do something with the ricotta other than just caving and eating the entire tub with spoons. There were also very ripe tomatoes, and two contrasting colors of basil: Italian green and dark purple. Inspired by picking a plum hanging over the sidewalk that took some acrobatics to reach (it was worth it), we decided to add some of the yellow plums we’d bought from Jones Creek Orchard, adding a sweet and tangy element. Some sliced up fresh fennel for crunch and flavor, a sliced lemon cucumber, and a little lemon juice, olive oil and pepper later, we had a perfect summer salad. Enjoy the upcoming warm weather, have a picnic, and eat like it’s still summer while you still can. 1. Cut tomatoes in wedges. Discard stems. 2. Cut plums in wedges or slices. Discard pit. 3. Remove outer layers and inner core (if not very young) of fennel. Chop remaning white and fresh, crispy parts of green into thin slices. 6. Combine above ingredients. Sprinkle with lemon juice, olive oil, and crumbled ricotta. Stir gently to combine flavors. Grate fresh black pepper on top. Serve with any summer meal: Meats, fish, beans… Would go especially well with grilled tuna.